Here is my father, Jim Fisher, fabricating wrought-iron panels for the bell tower of the Ursuline Convent on Chartres Street in New Orleans. He was a prolific commercial artist in New Orleans from the 1950's through the 1979. Then he moved ot Santa Rosa, California and began again. This is me learning the craft of ironwork in the Jim Fisher studios. It was one of the many off-beat old world skills I got to experience in my teens and early twentys. Little did I know how much these things would shape my artistic vision. That scrawny fellow is me. This was Magazine Street, early 1970's, during the summer. My dad and I were making the bell-tower for the historic Ursuline convent in the French Quarter. Wish I still had that hair. I made this while working in Santa Rosa, Ca. in about 1983. They are carved redwood with gold-leaf letters. The two coins are also carved and covered with gold-leaf. These signs were beauties, but very expensive and time-consuming to make. I barely broke even on these. It was tough to make a decent living and have a real life making objects like these. I lost everything (belongings, friends, women, etc) a couple of times over. But the experience I gained was priceless...Finally, I got off the roller coaster and joined the Army. Smartest move I ever made. Now I'm back. This was in about 1982. I made a few of these flyers for this local dinner theater. In addition, I helped with painting sets and assorted odd artistic projects. The pay was in beer and the chance to experience it. During my Army career I was in some great units. I was in the process of painting our unit symbol, the gator, in this photo. The lower scroll read Alpha Gators when it was done. This was a classic Cold War combat arms unit that was filled with tremendous people having an unforgettable experience. I even managed to woo a fantastic German gal into marriage! The Iron Curtain came down on my watch over there. We worked very, very hard, spent months out in the field and were unbeatable. This ancient design of wooden boat is still in use around the Persian Gulf. I went aboard this one in the mid 1990's. The broad experience and great travel adventures I've had fuel my art now. I was a Paratrooper in the United States Army, and proud of it. Airborne! 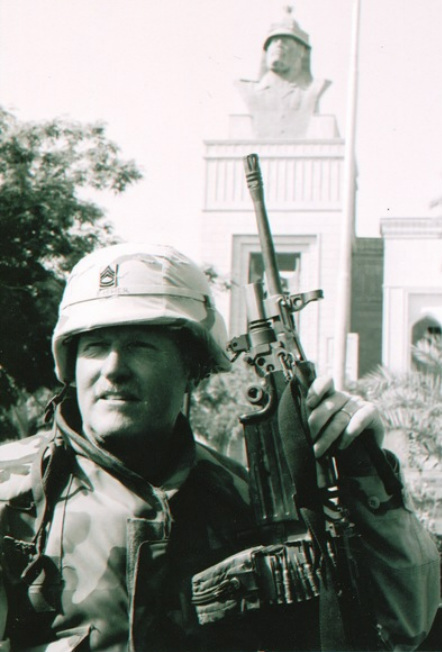 Here I am in Baghdad, 2003. I spent four years in Iraq, first as a soldier, and then as a security contractor. I cannot deny that I was shaped by these astounding experiences. Here I am drawing "Wooden Ship #2" in my studio. Notice the model ship, a pirate ship made by the Revelle plastic model company. I always prefer to draw from life and never, ever, copy a photograph. NEVAH.... That said, I do refer to photos to get historical details right but I change the perspective. I often "build" objects from my imagination using two and three-point perspective. This Linoleum block-print was done in the 1950's when I was a baby. I suspect it was a reductive print. My father had a Siamese cat named Bourbon, who appears here. Both were well known characters in the Quarter. Have you ever felt such frustration? To the Left is my Father's work. He was Jim Fisher, and in his day was a very well known artist in the New Orleans. "Man Kicking a Trash-can in the Vieux Carre"